Pantone, the world’s color authority, has announced this year’s color to be Emerald. This rich hue flatters any skin tone and dazzles in each and every light. 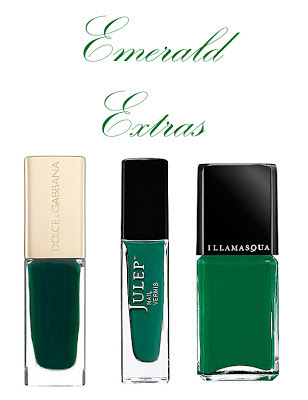 While this gives me an excuse to bust out all my emerald jewels daily this year, I of course thought about how to incorporate this regal color into my beauty rotation. Being the nail polish enthusiast that I am, my mind immediately thought of nails. 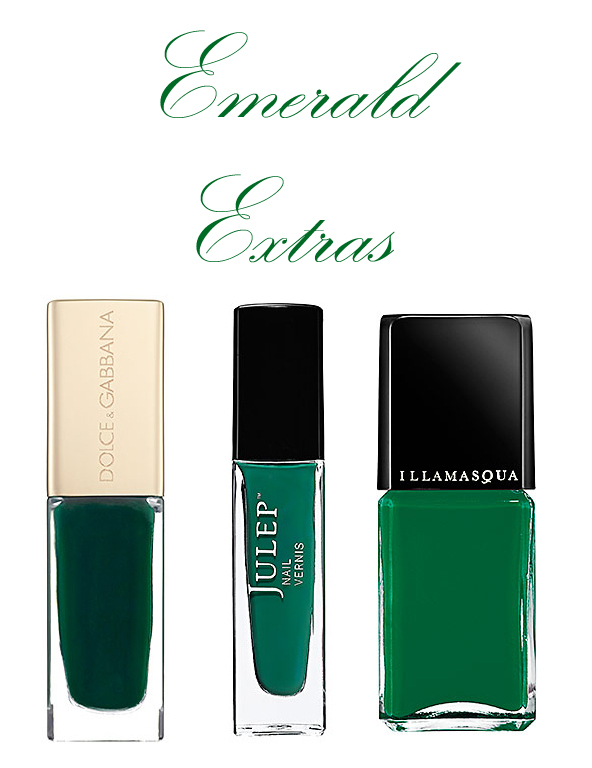 From strong opaque picks to shimmery stunners, an emerald manicure is a must this coming spring. If last year was any indication, I am sure to exhaust this lovely color over many, many manicures. Tangerine Tango (last year’s color) was an absolute hit and I’m looking forward to numerous beauty and various other collections decked out in this luxurious green color. In the meantime, I’ve rounded up a few beautiful polishes that will delight any girl seeking an emerald shade this upcoming season. 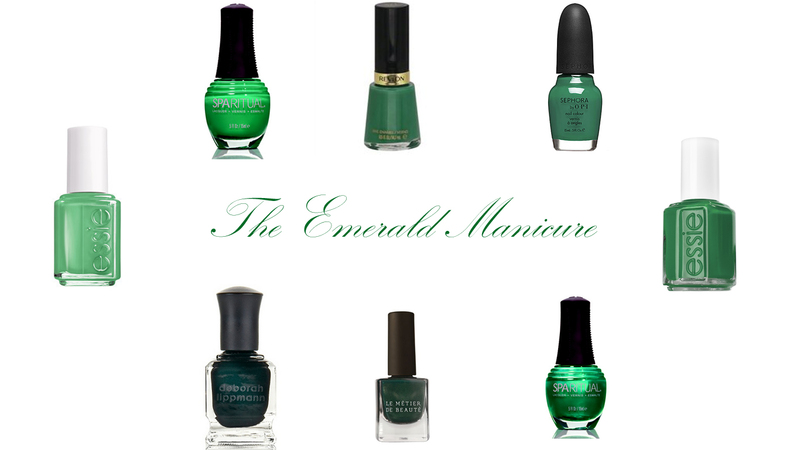 Whether it’s a light green or a true sparkly shade, your emerald manicure will surely have others feeling green with envy. If you haven’t noticed already, it’s Valentine’s Day and if you’ve got yourself a cutie to smooch up to on this day of love, you have to make sure your pucker is in tip top condition. From smeared lipstick to chapped horrors, these tips are sure to keep you looking perfectly kissable for your Valentine festivities. Nothing says “please don’t kiss me” like a set of dry, unsightly lips. A good exfoliation the night before or a few hours before your night out can make all the difference when it comes to a beautiful pucker. In order to get a flawless foundation for lipstick application and pillow-y soft lips, use a lip scrub like Fresh Sugar Lip Polish (cannot get enough of this miracle product!) or mix your own Brown sugar & olive oil concoction at home for a DIY quickie. To get an extra oomph and va-va-voom factor try this natural lip plumper recipe here. I always feel iffy about lining directly onto lips without a proper coat of primer. Whether it’s your favorite lip balm or a quick swipe of a soothing lip treatment, make sure you have something on your lips before any color application. My go-to pout primer is DuWop’s Lip Venom Lip Plumping Balm – I love lip plumpers and yes, this does give a bit of that minty, tingly feeling once applied—for those who shy away from pouty lips or that classic tingle you may want to use this product sparingly. Whatever colored lipstick you will be choosing for your sweet evening, choose a liner of a similar hue and line your pretty lips evenly & neatly. Choose a stain in a similar shade to that of your lipstick, and apply to your lips. You will thank yourself for this tip as the night goes on. After multiple sips of your drink, bites of food and quick smooches, your lipstick will begin to breakaway but your stain will provide just enough color to keep up with your full look and the wear will look really pretty as well. Make sure to apply your lipstick with a lip brush as it will be extra precise and look perfect. After any lipstick application it is always, always recommended to blot with a tissue. It neatly takes off any excess product and leaves behind just enough color and sheen. Make sure to clean up the corners of your lip of any uneven lines and perfect your shape. Hope everyone has a super sweet Valentine’s Day & if you’re single on this day of love, grab a few girl friends in the same boat, throw on your highest heels & prettiest lipstick and go out to dinner or drinks! There’s no reason to be alone on this stupid holiday. With Valentine's Day right around the corner, everyone is beginning to feel the love. From heart shaped candies to sweet cards lining stores all around the city, it's hard not to think of this sweet day. While many will be thinking of ways to make V Day special for their significant others, don't forget to love yourself a little extra too. Stop by Fix Beauty Bar, 847 Lexington Avenue (between East 64th&65th streets,2nd floor) and pick up a pass for a free ride at Soul East 63. Enjoy a little beauty TLC post workout! 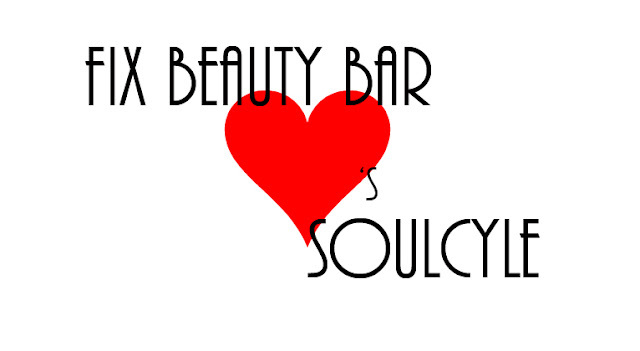 Come ride at SoulCycle (140 East 63rd Street) on February 14th and be treated to free blowouts & manicures on site courtesy of Fix Beauty Bar.